Our aromatherapeutic facials are customized to each individual client. We utilize an array of natural botanicals, holistic compounds, vitamins and alpha/beta hydroxy acids. All Elán skin-care products have been dermatologist tested and proven to be safe, effective and of course, cruelty free. With emphasis on rejuvenation, this facial treats bodily stress & replenishes the skin. Includes a massage of the face, neck, shoulders & arms. Customized to each individual client. Treat yourself to this wonderful experience! Includes a 3 step deep cleansing, exfoliation, extractions, lip or brow wax and therapeutic mask with steam, PLUS a hydrating, RELAXING massage of the face, neck, shoulders & arms. 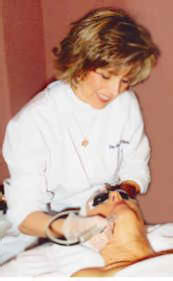 This facial may be customized for clients with rosacea & very sensitive skin. Ask for the Calming facial, if you desire a gentle treatment. The perfect facial for problematic skin!! Consists of a deep pore cleansing, exfoliation, steam, extractions, customized mask & high frequency. To achieve more dramatic results, we recommend a series of 6 treatments. Effective treatment that aids in the elimination of wrinkles, scarring, age spots & acne. This completely natural product (made from sugar cane) is extremely effective on skin damaged by the sun. Regular glycolic peels & home care will DRAMATICALLY improve your complexion, and take years off your appearance! SAFE & GENTLE, no down time. Effective “on the go” treatment! Your Esthetician will choose a 40% or 50% glycolic peel, followed by hydrating serums to get you GLOWING in a hurry! Our most aggressive treatment! Combines a Vita-C/Lactic acid peel, glycolic peel, and a thermal-reactive enzyme. Each treatment enhances the other! This facial firms, smooths wrinkles and scars, diminishes pores, lightens sun spots, and imparts a polished, youthful glow! (skin may be red for 1-2 hours due to the thermal activity of the enzyme) No down time or pain. This amazing treatment begins with an VITA-C scrub, followed with a glycolic peel! Firms the skin and exfoliates.VERY effective for aging, lines & wrinkles, pore size, scarring & discoloration. Immediate results for a WOW look instantly! No pain or down time. Perfect for clients who are not candidates for microdermabrasion. One of our most popular facials! Age Spots, Dark Patches due to sun, pregnancy or hormones. Perfect for people who are unwilling to undergo invasive treatments due to the high cost, potential side effects, discomfort & long recovery. 45 minutes - $100 - Add a ½ hour facial $130. Vitamin C Microcrystals slough off dull, dead skin cells. Warming Activator is then applied to suppress sun spots & promote collagen. Great for tired, aging skin. INSTANT RESULTS - No pain or downtime! Relieve Stress, & relax sore, aching muscles AND address lines, wrinkles & aging with our “TOTAL BLISS” package. Perfect for couples, girlfriends OR yourself!! Services may be done on the same or separate days. ENJOY!! Take a few minutes to destress! Our fabulous therapists will relax tired, tight muscles in a hurry. Perfect for lunch hours, or busy days! The perfect treatment for the maintenance and upkeep of male skin. This facial includes deep cleansing, steam, extractions and a therapeutic mask. Body, Bikini & Brazilian Available. Our purpose is to provide our clients with the ultimate in skin care & personal services. Our goal is to help you to be your best self with an educated, natural approach to health, beauty & wholeness. Our aesthetic team pledges to maintain the highest standards and to provide our customers with extensive product knowledge by pursuing continuing education, blending the forces of nature with the vigor of modern science. THE DERMAL CLINIC LODI’S PREMIERE SKIN CARE SALON OFFERS THE FOLLOWING, AND SO MUCH MORE!! Earth Lights –The Next Generation of Mineral Makeup! Elán Botanicals – Effective, Aggressive yet Gentle, Results Driven!!! Bare Escentuals "Bare Minerals, make up so pure you can sleep in it"
Click here for Events and Specials!